Is diffusion the answer to the US productivity puzzle? Few economic debates are as long-running, as intractable, and as beloved of bloggers as that over the pace of technological change and productivity growth. As we all have seen, changing technology has dominated daily life and news headlines in the US to amazing degree in recent years. But these changes are barely evident in the economic statistics on productivity, which should tell us if technology is really raising living standards over the long term. This disconnect between the apparent pace of technological change and our tools for measuring it has led to a huge debate over whether technological progress is “really” slow or “really” fast. A new theory now making the rounds has the potential to shake up some of the entrenched positions in this debate. The main source of the productivity slowdown is not so much a slowing of innovation by the most globally advanced firms, but rather a slowing of the pace at which innovations spread throughout the economy: a breakdown of the diffusion machine. 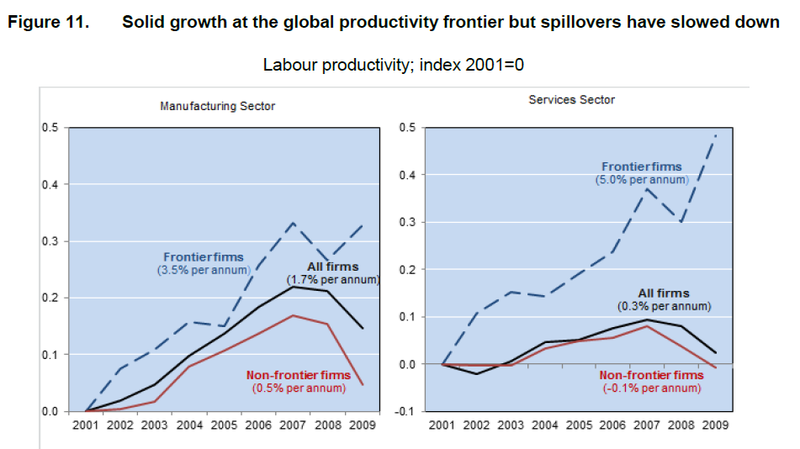 Indeed, a striking fact to emerge is that the productivity growth of the globally most productive firms remained robust in the 21st century but the gap between those high productivity firms and the rest has risen. I find this explanation very intuitively appealing. I also like the way that it moves the debate over productivity back to real empirical phenomena (the adoption of technology), and away from subjective evaluations of recent innovations. The debate between the techno-optimists and techno-pessimists was never a very satisfying one, because it was so clearly just a static clash of preconceived views (the WSJ’s Tim Aeppel captures it well in his piece on Joel Mokyr and Robert Gordon). The iPhone is amazing, say the optimistists; but it’s not as great as indoor plumbing, say the pessimists. There’s no obvious way to decide between those two statements, so which tribe you supported in the battle was more a matter of emotion and prior disposition than anything else. The techno-pessimists think the productivity numbers, though not without their problems, are telling us something about the pace of technological progress: it’s slowing down. The techno-optimists prefer to believe their eyes rather than the numbers, and say there are all kinds of reasons why the wonders we see every day might not be showing up in the statistics. The diffusion explanation allows you to believe both your eyes and the numbers: it’s true that amazing things are happening in research labs, but it’s also true that these things are not giving the whole US economy much of a lift. The diffusion argument also seems like a more satisfying approach than returning to the debate over how well the productivity statistics capture the effect of technological change. This debate was done to death in the 1990s, when the advent of the personal computer similarly failed to ignite nationwide productivity growth–at least, until the IT bubble. While many people in Silicon Valley are now reviving this argument (again this was well covered by Tim Aeppel in a recent piece), the latest iterations offer little that has not been said before. The diffusion argument says, essentially, that Silicon Valley is being measured just fine, but Silicon Valley is not the whole economy–a point which is probably obvious to anyone not in Silicon Valley. Of course, defining the problem as one of diffusion does not immediately solve the productivity puzzle, since how the diffusion of ideas and technologies works is not well understood. The problem could, for instance, be related to the decades-long slowdown in the pace at which new firms are being created. Though since no one really understands why the startup rate is slowing, it’s not even clear if it is a cause or an effect of the productivity slowdown. But the diffusion argument at least opens up productive (ahem) ways of thinking about the issue. The thesis is clearly linked, for instance, to the ideas of Edmund Phelps, who is worried that innovative activity is too concentrated in a small part of today’s societies, and is much less socially widespread than it was during the 19th century (see his recent piece in the New York Review of Books). * The authors of the OECD report deserve to be named; they are: Müge Adalet McGowan, Dan Andrews, Chiara Criscuolo and Giuseppe Nicoletti.